Data miners have unearthed unused text in The Legend of Zelda: Tri Force Heroes, which suggests that Nintendo plans to release free and paid downloadable content for the Nintendo 3DS exclusive. 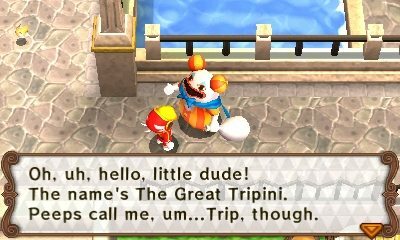 The Cutting Room Floor has shared the dialogue, which is attributed to wacky clown The Great Tripini – who currently teases that “some cool stuff can, er, happen…” if players leave SpotPass enabled for the title. There’s reams of conversational text that has been uncovered, revealing that new areas in the Drablands will steadily be “discovered” for players to adventure into. While there are references to free updates, these are referred to as being a necessity before players can purchase add-on content rom the Nintendo eShop. If this still forms part of Nintendo’s plan for Link’s multiplayer adventure, we’ll presumably hear in the coming weeks or whenever the next Nintendo Direct will take place.